Spruce up one of fall’s vegetable stars by adding spices and black beans. These southwestern Brussels sprouts may become your favorite seasonal side dish! No more than five years ago, I was still in the “I wouldn’t even feed these to my mortal enemy” stage of Brussels sprouts disdain. When one of my most trusted food-loving friends insisted that I try her favorite shredded Brussels sprouts recipe, I gave her the stink eye. What was she trying to do to me?! It doesn’t take much to flavor sautéed Brussels sprouts. Typically a glug of olive oil, and a sprinkle of salt and pepper does the trick. 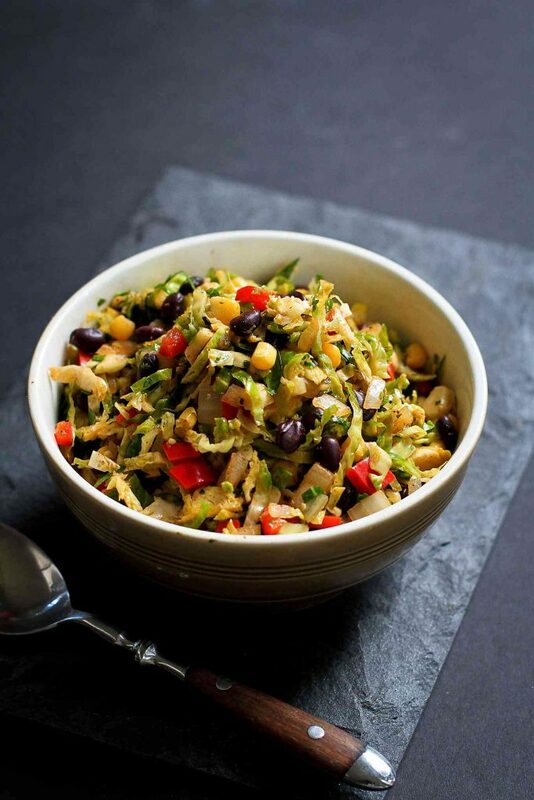 But in this southwestern Brussels sprouts recipe, I kicked up the flavors by adding some cumin, chili powder and paprika, then doubled-down on the fiber and protein with the addition of black beans and corn kernels. While these southwestern Brussels sprouts are a great side dish option for pork tenderloin or roasted chicken, they can easily morph into a light lunch when served over a bed of cilantro lime rice or another whole grain. I’m so excited to see how many of you are working to #VegItUp with me! The goal? To add one extra serving of veggies to your diet each day. Keep those Instagram photos and tweets coming! And be sure to check out my other #VegItUp recipes. Cut each Brussels sprout in half through the root, then thinly slice crosswise. Set aside. Heat 2 teaspoons olive oil in a large nonstick skillet set over medium heat. Add the onion and bell pepper. Cook, stirring occasionally, until the vegetables are tender, 4 to 5 minutes. Add the garlic, cumin, chili powder, paprika, salt and pepper, and cook for 1 minute. Add the remaining 1 teaspoon of olive oil to the skillet. 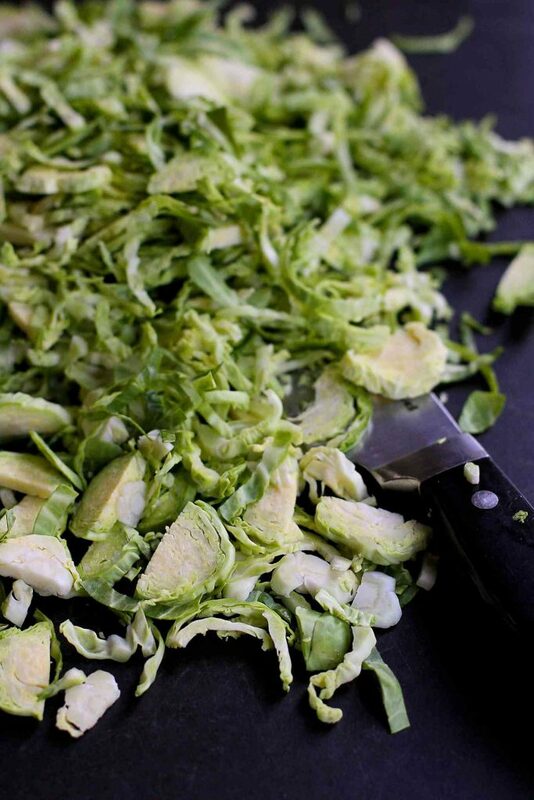 Stir in the sliced Brussels sprouts. Cook until the Brussels sprouts are bright green and just tender, about 4 minutes. Stir in the black beans, corn, lime juice and cilantro. Serve. This looks delish! I have a pound of brussels sprouts from my CSA this week begging to be used in this. And beautiful photography! Good timing…I have been looking for a new BS recipe! This one, next up. I felt the same way about Brussels sprouts… and I’m SO GLAD we both turned the corner because they’re delightful! And I love this Southwestern take on the veggie… Gonna have to try it soon! Nice! 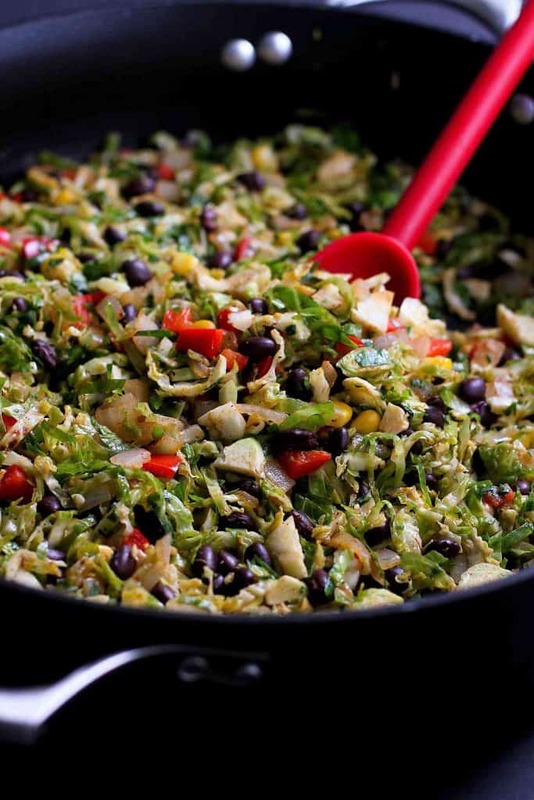 What a great way to enjoy Brussels sprouts, I love these flavors! This is such a great take on brussels sprouts! 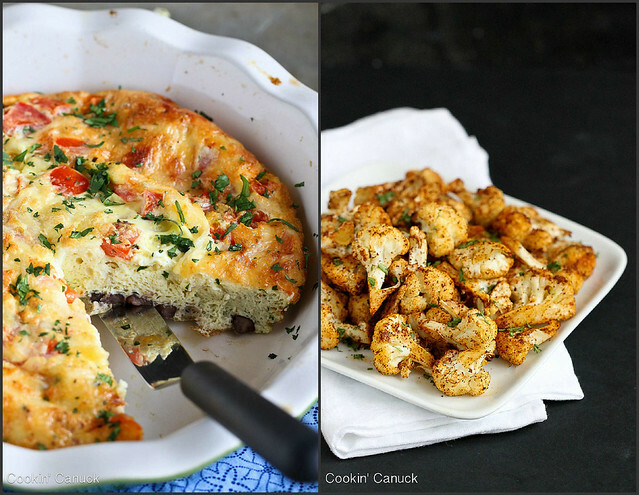 I’m a recent brussels sprouts convert as well so I can’t wait to try these! Love this! Always looking for new ways to enjoys brussels sprouts! I’m always looking for ways to add Brussels sprouts into our diet! Thomas will love this!